Wikipedia defines ‘Praise’ as an ‘act of making positive statements about a person, object or idea, either in public or privately.’ Normally, praising a person is associated with his accomplishments, achievements and his hard work. Praising a person makes him feel good, and good bosses always praise their team. But, the activity of praising has some deep, psychological side-effects as well, and such is the intensity of this harmful effects that sometimes it’s better not to praise in order to get things done. Khan Academy’s founder Salman Khan has written a beautiful blog wherein he has explained why he won’t praise his son, even if he has done the right thing. He explains that a child’s brain develops as its used more, and once praised has been lavished on the child, this development hampers. Scientific research has shown that consistent praising of a child leads to unhappiness, disinterest in study and sports, and a shocking depression early on. Yes, child psychology is way too different than the psychology of an employee who is well trained, expert and professional in whatever he is doing. But the internal wiring of human beings are similar, and age is just a number. If unnecessary and untimely praise can negatively affect a child, there is no reason not to believe that praise can be harmful for employees as well. The entrepreneur, who is also the leader of his tribe, the head of his organization, needs to understand the complex mechanism which goes behind praising, so that his employees are not de-motivated, and they are wasted. One of my friends who worked in an assembly line of a popular automobile company in Pune shared one interesting story about his boss. Every day at 4.00 PM, couple of hours before the day finished, his manager would enter the production division, and praise every employee one by one. It was a fixed, non-stop ‘routine’ which he followed every day. Some old-timers used to say that this praise was nothing but a ‘to-do’ item in his list, and after 4.30 PM, he used to tick off this ‘activity’. That’s it. Praising was one of those tasks which he routinely did, without any break. No, this didn’t work, and none of the employees ever felt truly praised. Be genuine, and true to praising and it will work wonders. Make it a routine, an activity, and it will hopelessly bomb. Such feedbacks actually take all the fun away. 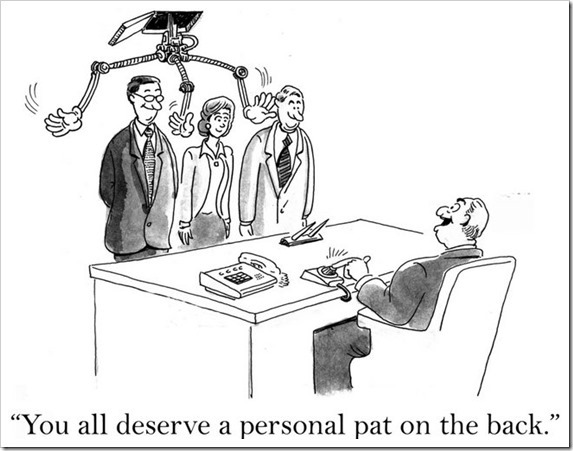 Let the employee live the high point of his career, in a better way; let him hog the limelight. Constructive feedback from the manager can wait for some other time. Such feedback or suggestions actually create a doubt in the employee’s mind, and make him wonder whether he did the right thing? The first step is, banish that ‘Employee of the Month’ contest. Instead of a delight, the prize actually diminishes the whole point of praise. After the end of the month/quarter, every employee thinks of the winner, and sub-consciously pictures him/her as the ‘Employee of the Month’. It becomes a race, and the surprise element is lost forever. Praising should be done when no one expects it. It makes it more powerful, and more effective. The smart boss will identify the most result oriented employees within few months of their joining. The work performed by them speaks volume about their capability and potential. Now, consistently praising them in front of their other ‘less-efficient’ colleagues can be actually harmful. On one hand, it can inflate an unnecessary ego in them and on the other hand others may be feel offended and/or jealous. Although you as an entrepreneur can’t help the jealousy factor, but yes, you can strike a perfect balance while praising. Once the potential of an employee is known, the limits of excellence should be expanded in a way which makes them hungrier for praise and good words; and not make them over-confident. Remember, every human mind is unique in nature, and it takes deliberate planning and motivation to make them reach their full potential. You as the leader of your cult (read company) need to nurture the talent, understand their strong and weak points, and accordingly help them grow. Praising for small accomplishments, which you know anyone can perform in the organization can make them complacent early on; and they may not give in their 100%. Like Salman Khan mentioned in the blog of Khan Academy, excessive praising can halt this development of brain, and lead to mediocrity. Praising is a very powerful tool for motivating others, but like with every powerful tool, it has it’s side-effects. Use it judiciously, and intelligently; and it can make wonders. Use it recklessly, without any planning, and it can destroy the full capabilities of the employee. "5 Secrets of Praising: How Should The Entrepreneur Praise His Employees", 5 out of 5 based on 1 ratings.